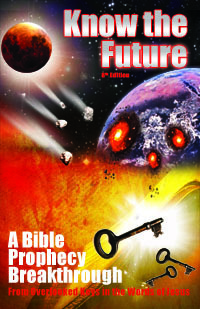 As the author of a book called Planet X in Bible Prophecy, it’s no surprise that several readers have written me about the recent announcement of two new planets dubbed Planet X and Planet Y.
What’s my opinion of this? Could these fulfill bible prophecy such as Wormwood? Here’s a quick explanation to answer these questions. The announcement is only presenting new evidence that suggests a couple more planets exist. The evidence comes from studying the orbits of other objects around other stars beyond Neptune, called extreme trans-Neptunian objects” (ETNOs). There are irregularities in these orbits that could be explained by at least two more massive planets beyond Neptune. If these planets exist, they would be so far out–more than 200 times earth’s distance from the Sun (200 AU)–that they would be difficult or impossible to spot with existing instruments. That’s why you may be waiting a long time before they are confirmed or ruled out. This naturally leads to the question of whether this is finally some official evidence for the infamous legendary Planet X.
That’s a question that comes my way constantly. There are plenty of YouTube videos, photos, or expert testimonies on the Web purporting to prove Planet X’s existence. Some readers who come across these send them and ask my opinion on a regular basis. What I tell them is that, despite the title of my book, I’m not looking for Planet X, and I don’t recommend anyone else does either. Planet X does not matter. Bear in mind that Planet X is a grab-bag of legends and theories about a tenth planet on some arbitrary-sounding “3600 year orbit” supposedly responsible for past cataclysms. It supposedly was due to come in 2003 and then again in 2012. It’s a mess and has been rightly debunked by astronomers. However, there is an important truth hidden in the theory: that there can be other undiscovered planet-sized objects out there still. That’s why my exposure to the Planet X theory in 2002 played an instrumental role in helping me to finally begin to see “star” Wormwood (Rev 8:10) as a rogue planet, and not just a comet or asteroid. This was important as objects of that size don’t work to explain the events of the cosmic disaster sequence from the 6th seal to the 4th trumpet (Rev 6:12-8:13). At the same time, I was unable to imagine there could be undiscovered small planets lurking out there before I heard Planet X theory. Since then several dwarf planets have been discovered by astronomers, leading to the demotion of Pluto from planet to dwarf planet. I think a dwarf planet can explain everything Revelation describes happening including the great global earthquake, global meteor shower and perturbation of Earth’s orbit to a 360 day year. Definitely not for at least two reasons. The reports suggest new planets that are massive, several times larger than earth. Wormwood will be something smaller than earth, no bigger than Mars, since it breaks up from earth’s gravity instead of the other way around. The report places these objects with orbits out past Neptune (TNO). Since Wormwood is described as passing close to earth, it cannot be an TNO but must be something orbiting the inner solar system. More importantly, I would not count on Wormwood to be sighted and reported very long before it strikes. When I read Revelation 6 about the beginning effects of Wormwood at the 6th seal, the panicked stampede of people to the mountains tells me they were not warned or not in time enough to prepare something better than mountain caves. In other words, I don’t look for evidence for Wormwood any more than I do for evidence of Planet X. I’m counting on the coming Elijah prophet (or another prophet sent by God) to warn us all when it is coming and that it is time to flee to the safety God has prepared. If you have more questions on Wormwood see the category on my main site. Is “Prophet” Tom Deckard a True or False Prophet? Hi Tim. I have just watched a video on you tube submitted by BPEarthwatch, i think the guy is a Christian. It shows a portion of Google Sky in which can be seen clearly a wing disked object, apparantly this object is Nibiru [ Wormwood? ]. This area of Google Sky had previously been totally blacked out. I have checked the co-ordinates and confirmed this fact. I also confirm that this area was censored previously. it’s only a short video ,would be interested to hear your comments. I heard that conspiracy theory. Makes no sense to me. If they really wanted to hide something they would blend the background to look like some other part of space and no one would know the difference. The big empty rectangle looks more like a glitch or missing data. What are your thoughts on WSO YouTube videos by Steve Olson? And the recent earthquakes? Very scary stuff. 1. Normally NEO’s that don’t have a name, get named by the observatory or the person that finds them. 2. Given the location and the focus being on the southern pole of the Earth, the chances of something being hidden in that direction would be much higher. In your opinion, would this be a prelude to a fulfillment of a prophesy, or just a poor name choice by the observatory? I just wanted to comment on this wormwood article. I am not familiar with the issue you talk about as wormwood. I have read where you connect it to Rev. 6:12-17. I personally believe that this Rev. scripture is describing a nuclear war exchange in the world. It certainly does not describe a so-called blood moons prophecy. I do not subscribe to the blood moons prophecy theory at all. One has to read that into the scriptures to believe it. What do you think about my believing Rev. 6:12-17 describing a nuclear bomb exchange? The greek word for earthquake here means something that causes an earthquake other than by natural means. It is known that even underground nuke tests do cause earthquakes. Sounds like you’ve been listening to Michael Rood? If you read Rev 6 in the full context of the 1st trumpet through 4th trumpet you’ll see it’s all about astronomical and atmospheric disturbances and impacts on earth having to do with a “star” Wormwood. A nuclear war does not explain the entire sky moving like a scroll or people running to the mountains (to avoid tsunamis from the rocks impacting the oceans). Read http://escapeallthesethings.com/category/planet-x/ for more on all this.